Actions speak louder than words, they say. If so, the New Order's Agents are absolutely deafening. Inspired by what he saw and/or heard, Mr Trust put down the cash for 3,000 shares. This sent us screaming past the 305, 306, and 307 billion marks. Mr Trust, who clearly knows in whom to put his trust, earns a Triple Supreme Protector's Tip of the Hat™. 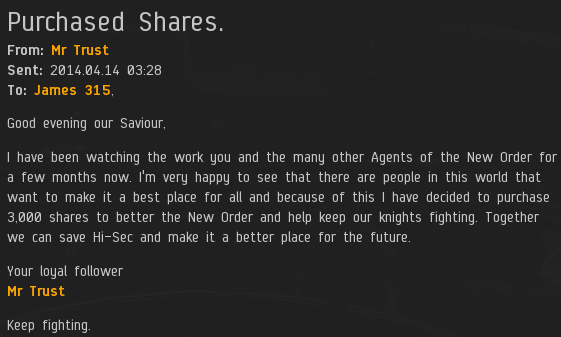 Citizens of highsec, are you putting your trust in the right people? Give your money to the New Order and you'll be able to answer that question with a big "YES".